The GemSeal team is passionate about pavement products. Since 1957, GemSeal has been researching, developing, and specifying superior pavement preservation products for commercial and residential applications nationwide. Throughout that time, GemSeal has proven itself as the leading manufacturer of sealers and complementary pavement products designed to protect and prolong the safe usability of asphalt. In fact, when you choose GemSeal, you will notice three distinct differences in our people, products, and service. First, our people have vast experience and superior technical knowledge. We can help you specify the right product and application process for your region and unique job-site circumstances. 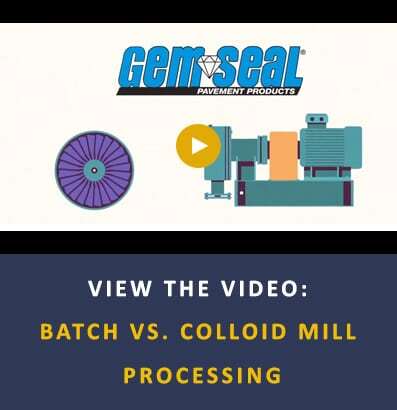 Plus, we own nine manufacturing plants with customer service centers and, to provide nationwide support, we partnered with manufacturers who have similar colloid mill processes and who share our focus on quality. Second, our products are manufactured using a precision colloid mill. This process produces the most consistent, uniform pavement products available on the market. Third, GemSeal is company owned (not franchised), which means you can expect the same high-quality, consistent products and outstanding customer experience in every location. Put us to the challenge and see for yourself! Please use the form below to subscribe to our newsletter and get the latest updates from GemSeal.